Spray baking dish with PURE. Halve onions. Cut a flat spot on the bottom of each and remove all the insides except for the 2-3 thickest outer rings. 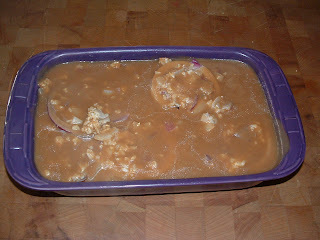 Place onion cups in baking dish. Chop onion insides into fine pieces. Prepare brown rice and set aside. In a large skillet melt butter. Add garlic and saute' until fragrant. 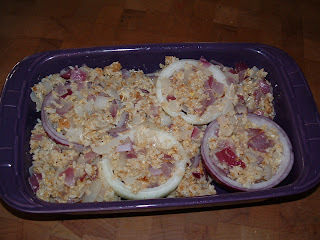 Add bread crumbs, prepared rice, cheese, beaten egg, salt and pepper taste. When well blended and egg is cooked fill the onion shells and place remaining rice mixture around the sides. 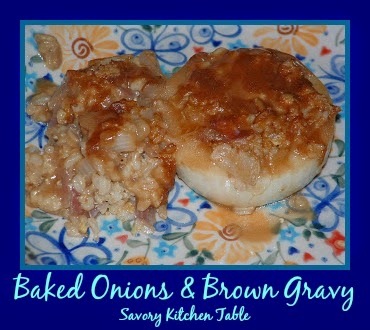 Prepare gravy and pour all over the onions and rice mixture. In a saucepan, melt the butter over medium heat. Add the flour and cook, stirring, for 5 minutes, until the mixture is golden-brown and fragrant. Add the garlic and cook a few seconds more. Whisk in the beef broth and Worcestershire sauce. Bring to a low boil. Reduce the heat to a low simmer for 15-20 minutes, stirring occasionally until desired consistency.